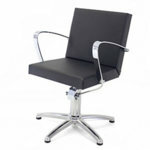 REM Royal Hydraulic Styling Chair on 5 Star Hydraulic Base as Standard. Disc base or Square base available as an option(please use the drop down box to choose your base). Sizes: Height 49 - 61cm, Width 58cm, Depth 57cm. 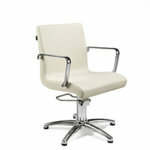 also available on disc base or square base, please use the drop down box to choose. Dimensions width over arms 58cm, seat min 48cm, seat max 59cm. also available on disc base or square base please use the drop down box to choose. 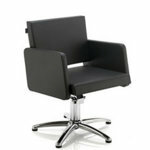 Dune Styling Chair is a hydraulic chair supplied on a 5 star base as standard with disc or square bases as options. The Dune is fully upholstered and is available in any REM colour, with feature piping which can be a contrast colour if preferred. Dimensions width over arms 66cm, seat height min 53cm, seat height max 64cm. Matching Dune wash units available. 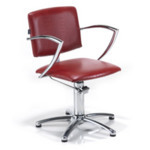 Rem Samba Hydraulic Styling Chair on 5 star base, the Samba has chrome steel arms with upholstered arm caps for client comfort. Available in any REM fabric colour. Dimensions width 62cm, seat height min 49cm, seat height max 60cm. 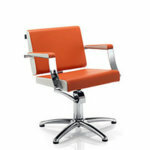 Rem Miranda Hydraulic Styling Chair on 5 star base, the Miranda has chrome steel arms. 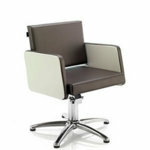 Available in any colured upholstery from the REM fabric colour. 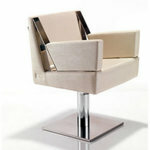 Miranda chair in image finished in rem Galaxy upholstery. 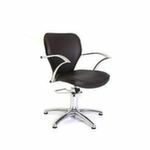 Dimensions width 55cm, depth 63cm, seat height min 44cm, seat height max 56cm. 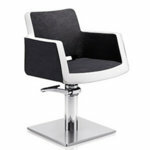 REM Shiraz Hydraulic Styling Chair on 5 Star Hydraulic Base as Standard. Disc base or Square base are available as an option(please use the drop down box to choose your base). Sizes height 49 - 60cm, width 60cm, Depth 64cm. 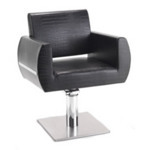 Dimensions seat height 67cm max, width 50cm, depth 61cm. 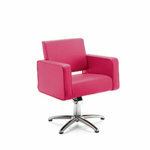 Available in any colour from the Rem fabric range(please use the drop down box to choose). 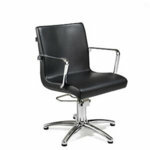 Sizes: Seat Height 45 - 57cm, Width 58cm, Depth 59cm. 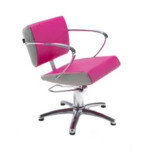 REM Evolution Hydraulic Styling Chair In Coloured Upholstery is both stylish and robust. 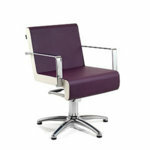 Available in any colour from the REM upholstery range. Comes on a 5 Star Base as standard, also available on Disc or Square Base as an optional extra (Please Use The Drop Down Box To Select Your Base and Fabric Colour). Sizes: Width 60cm, Height 50 - 62cm, Depth 69cm. 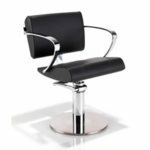 REM Peru Hydraulic Styling Chair Supplied on 5 Star Base as standard, also available on Disc or Square Base as an optional extra. You can choose any single or contrasting split upholstery colours from the REM range, Please use the drop down boxes to select a base type and single fabric colour. 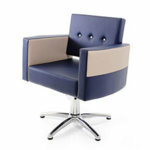 Please ring 01270 630280 to order in two tone colours. Sizes: Height 49 - 60cm, Width over arms 70cm, Depth 55cm. Sizes: Height 53 - 71cm, Width 60cm, Depth 60cm. 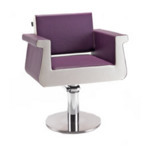 REM Vista Hydraulic Styling Chair available on 5 Star Base as standard or on a disc or square base as optional extra. 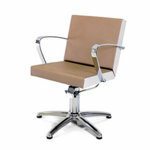 Also available in any colour fabric from the REM range (please use the drop down boxes to select your base and colour). Size: Height 49cm - 67cm, Width 58cm, Depth 59cm. 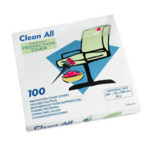 universal plastic disposable covers to protect your chair against possible stains caused by hairdressing products. Dimensions width 540mm, depth 55mm, height 230mm.